Swordbearers are unique Hive Knights tasked with guarding the bridge to the Oversoul Throne. A few can be seen in the Crota's End Raid and the Story Mission Last Rites. 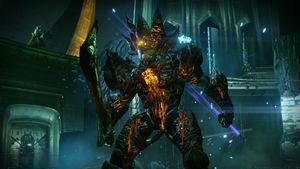 Killing a Swordbearer drops an Ascendant Sword which must be used to cross the bridge to Crota's fortress without dying to Bane of the Swordless and must also be used to damage the Gatekeepers and Crota. Swordbearers look very similar to other unique knights that appear in Destiny, Urrox, Flame Prince and Kandorak.